Digital education, in both meaning :). We might be easily mention the name of the most important innovation in transportation over the last 200 years. We might mention something like the combustion engine, air travel, Ford’s T-model, and others. But we might not that easily mention the single biggest innovation in education. We can read that puzzling question at MIT Technology Review. The question is a gambit used by Anant Agarwal, the computer scientist named this year to head edX, which is the MIT-Harvard effort to stream a college education over the web, free, to anyone who wants one. It is indeed rare to see major technological advances in how people learn. Internet, the web, and the power of data-crunching technologies should have changed dramatically the education methods. Remote classes have been arranged with video streaming with sophisticated interactive elements. Data and information on students could be processed individually or in group to make them learn more effectively. Online education is not new. In 2010, 31.3% of the US college students enrolled in at least one online course, while 700.000 students study in full-time distance learning. Still, education is called inefficient and static with respect to technology. It is often cited as the next industry ripe for a major disruption. This belief has been promoted by Clayton Christensen, an HBS prrofessor who coined the term disruptive technology. Disruptive innovations, he said, find success initially in market where the alternative is nothing. In Indonesia, where education in technology is still a limited priviledge, digital learning may find its way. Besides many limitation on the technology and the experiences, we may improve the efficiency of lecturing. As Agarwal said, the same 3 person team of a professor plus assistants that teaches analog circuit design to 400 MIT students now handles ten thousand students online, and could take 1 million. That is one of the result of the massive open online course, or MOOC. One of other expected results is how the top quality education, could change the world, or at least the nation. Why not? Currently about two thirds of the people signing up for the free online college course carried our in the US, comes from overseas. Means that for good universities, the methods, the curriculum, the materials are expected to spread easily, crossing the nation borders. But, as implied, MOOC will also be profoundly threatening to weak institutions. Sebastian Thrun, a Google researcher, predicted that within 50 years, there might be only 10 universities still “delivering” higher education. The keyword he chose, somehow implicates another concern: the commodification of education. Or, as Jason Lane and Kevin Kinser warned in Chronicle of Higher Education, McDonaldisation of college classes: the exact same stuff served everywhere. By working harder, we may change the direction, though. When Prof Gordon Day, then elected president of the IEEE, visited Yogyakarta in 2011, he mentioned the necessity for the engineering profession to expand the activities, by synergyzing engineers from academic world and industrial worlds, and supporting more roles from professionals in developing countries. That is the point that we will do these years. 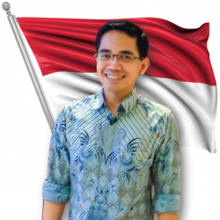 By synergyzing the academic and industrial world in the region, we will support Indonesian education institutions to grow and strengthen the education methods through digital technologies, to leverage the reputation of Indonesian education institutions globally, and to intensify the research and innovation to develop a breakthrough in education technology.